It is not too hard to find pink when I'm out hunting down vintage goodies. Look, there it is... in the little Victorian girl's dress. Love these antique autograph books. 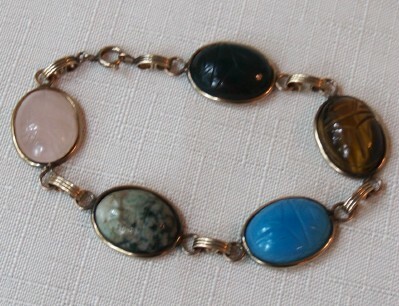 And here's some pink in this vintage bracelet. The stones are all made of glass. And this one I spotted at an antique show on Memorial Day. The very next day the same dealer had it at a different antique flea. I told her I had seen it the day before. Well of course I couldn't walk away from it two times! So home it went! This is the second batch of buttons. The other's have sold. This time I paired these with a pretty little rose nut bowl, made in Bavaria. 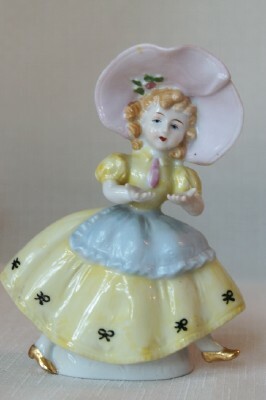 This little gal's hat certainly fits the pink theme. I keep thinking she is Little Bo Peep but of course, her sheep staff is not at hand. 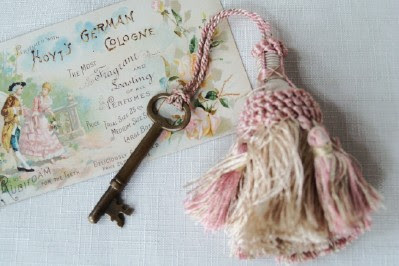 I paired this pretty pink and ivory tassel with an old brass key. Perfect together! These are some of my favorites of my recent finds. Just the right blending of pink and green. And one, just one stone is pink... a really nice scarab bracelet for those who like to wear them. Nice sized and good quality stones. 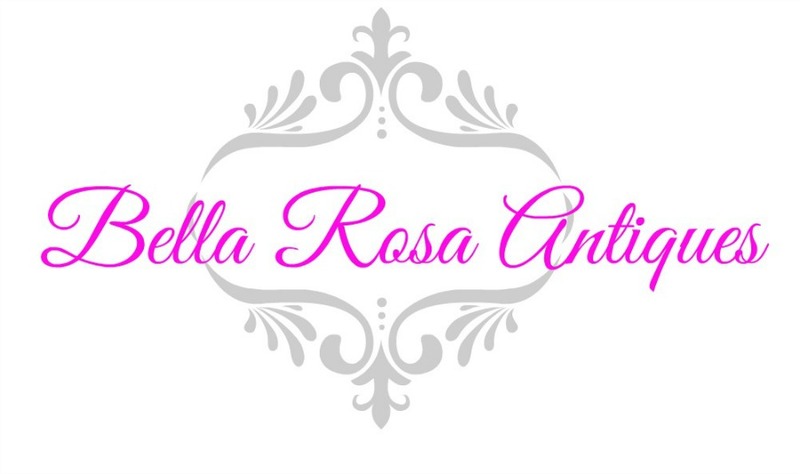 For more pinks, check out Pink Saturday where there's a PLETHORA of bloggers who LOVE my favorite color as much as I do. Some weeks there are more than 150! What gorgeous finds...love the tassel and key and all your pretty plates and that darling little girl....I am going out hunting tomorrow! I hope I find some good treasures, too! 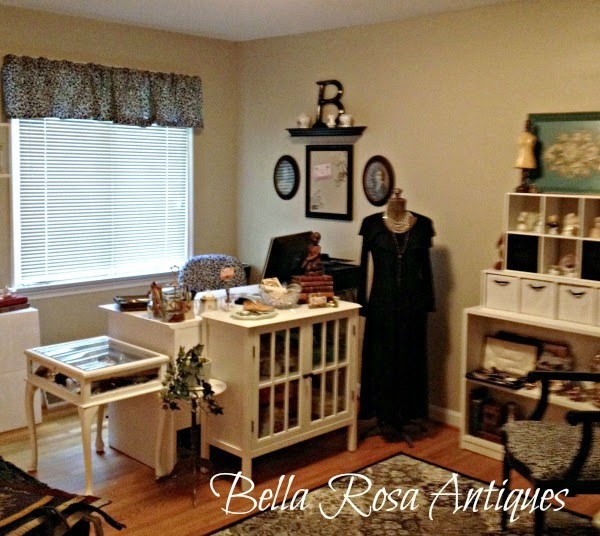 What a great assortment of treasures. I really like that little dish with the pink buttons around it. Love your sweet pinks. HPS! Super neat pink finds! Happy Pink Saturday! You found wonderful things and I'm glad you didn't let that plate pass you up. It must've been calling to you. =0) The tassle with the key is wonderful as are the three plates with roses...love pink and green! More great finds, Jillian!!! 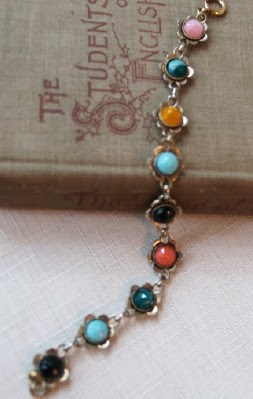 I love the key and the tassel..what a sweet combination! I didn't have a chance to go "treasure hunting" this week....too much to do with celebrations and watching the little grands for a couple of days. They wear me out, but in the bestest way!! Love the way you display your pinks. My favorite is the little girl with the pink hat that may or may not be Little Bo Peep! Stop by and visit me too! 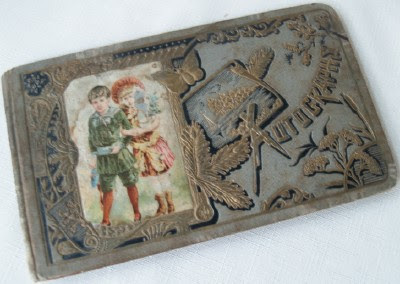 I love, love your antique plates...gorgeously romantic! Love the brass key and tassel the most! What a sweet pink and ivory tassel! And your "recent finds" plates are lovely. This is an AMAZING BLOG! Here from pink Saturday. Love that rose plate. Perfect for a tea party and anyone who follows me knows I LOVE TEA PARTIES!!!!!!!!!!!!!!!! What beautiful shades of pink! Those buttons are so pretty. What a great treasure trove of things pink!!! Love your pink and green plates! the old autograph books are so pretty.....I just got my great grandmothers! Love your pinks. Such pretties. Have a great day. Thank you for sharing all your lovely finds. Beautiful pinks! Love how you tied the tassel to the old key. I'm storing that idea in my memory! 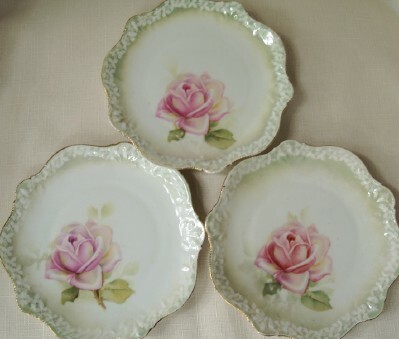 The rose plates are gorgeous! 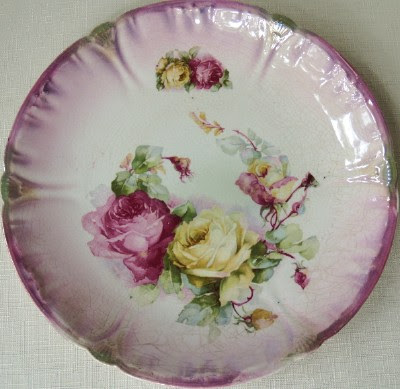 Beautiful finds, Jillian...love those rose plates...they are the perfect blend of pink & green! Have a wonderful week, Jillian!